Monkey Island represents a strange yet significant event in pirate history. Those of us who love pirates more than average; most of us would point to the Pirates of the Caribbean rides as the most influential element in our piratey formative years. This is a common experience we share across a wide age range – from the old to the young. But there exists a sliver of us – the piratey Gen Xers – that also largely fell in love with another piece of piratey pop-culture long before the floodgates were opened by the Disney films, and that was the 1991 videogame The Secret of Monkey Island. In many ways cutting edge at the time, today’s audience would likely view it as only a little better than Donkey Kong. But at the time, it was Pirate Monkey Magic, and no mistake. A game that existed solely to bask in a love of piracy, with little to no regard to history or realism. This was a game of pirate ghosts, pirate grog, entire pirate towns run by a pirate governor, and – of course – monkeys. Oh, the monkeys! And the music, for that matter. Cheezy midi tunes they may have been, they nonetheless carried power and emotion, and were catchy as all hell. To this day my phone ringtone library is almost exclusively made up of Monkey Island tunes. Secret of Monkey Island inspired a sequel – LeChuck’s Revenge – that maintained the true spirit of the original. Curse of Monkey Island followed, and while a stark evolution in animation technology wildly changed the look, most fans more or less agree that Curse was a worthy successor (despite its not being written by the original author, and therefore not necessarily taking the story in the direction originally intended.) The fourth, and by all beliefs final game, Escape from Monkey Island, was something of an embarrasement with awkward, glitchy controls, a lame storyline, a dreadfully emasculated Guybrush, and a general “sequel for the sake of a sequel” feel. And then there was nothing. For almost ten years, nothing. Not a peep. Fans would ask LucasArts about the potential for another Monkey Island sequel and get the equivelant of a sympathetic pat on the head. And then, out of nowhere, in June 2008 TellTaleGames announces Tales of Monkey Island to be released – not is some vague future – but in less than a month. They’d been working on it for some time, and yet not a peep ever leaked out. How they kept such a secret I’ll never know. But bless them, and may Neptune keep their socks dry. Tales of Monkey Island is what’s called an “episodic” game, meaning it’s release in downloadable chapters rather than a single game on disc. Once all the episodes are released they can be purchased as a disc, but for now you have to buy them all upfront and then receive one segment per month. Episode 1: Launch of the Screaming Narwhal, released in early July. This is the only part of the game I’ve yet been able to play, so the review should be considered accordingly. However, I fully expect that all the episodes will likely maintain the same level of quality. The game begins with two ships in battle – the first commanded by the cursed pirate LeChuck, currently embroiled in a voodoo ritual and holding Elaine Marley (Guybrush’s wife) hostage. 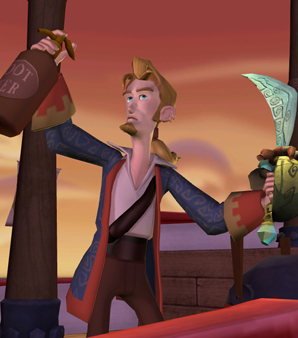 The second ship is manned by our beloved hero, Guybrush Threepwood, through who’s actions we live out the adventure. Following in the spirit of Escape from Monkey Island, Tales is a 3D adventure, albeit vastly superior to Escape. Not only is the art cleaner, but the new Guybrush look is much more appropriate (meaning less girly) and calls to mind the ghotee, blue coat sporting Guybrush of LeChuck’s Revenge. He’s still the awkward, less-than-robust pirate we’ve known in past games, but let’s face it, in Escape he was downright dainty. This initial scene is solved through a few quick puzzles, this of course being a game of problem-solving and dialogue rather than outright action, and Guybrush is soon stranded on Flotsam Island and looking for a way to commandeer the island’s only ship so he can defeat LeChuck and save Elaine. Throughout, the art style and humor is very reminiscent of Curse of Monkey Island, although I still don’t find myself laughing as much as I did when first playing Secret and Revenge. Perhaps it’s just nostalgia, or perhaps it’s the same humor losing potency over time, but subsequent games just haven’t been as endearing or hilarious. That said, Screaming Narwhal is still great fun. The 3D controls are easier to master than they were in Escape, and the puzzles are challenging without being overly so (well, for the most part. I may have cheated just once or twice.) This first episode ends with a small mystery, the nature of which I won’t share but I will state – for the record – my own initial gut reaction: Kate Capsize. This entry was posted in Games and tagged monkey island, telltalegames by Bilgemunky. Bookmark the permalink. My name is Doglock Hawk and I’m a mighty pirate!